The following obituary was taken from the Beckley Post-Herald, dated Thursday, March 28, 1929. H. M. Rodes, 52, a former resident of Beckley, died at his home at Meadow Creek, after a brief illness yesterday morning; it was learned here last night. Mr. Rodes moved from Beckley to Meadow Creek about 12 years ago, where he conducted a general store business. He is survived by his widow and one son. 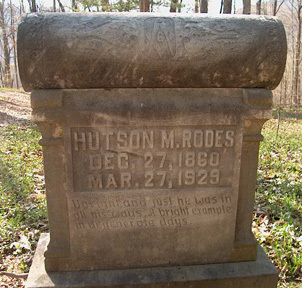 He was a member of the Beckley Masonic Lodge. Funeral services will be held Friday afternoon at 2 o'clock from the home. Interment will be made in a nearby cemetery, at which Hinton Lodge of the Masons will officiate. A number of loyal Masons will leave Friday morning in time to take train No. 13(?) from Hinton.